Vera Caspary. 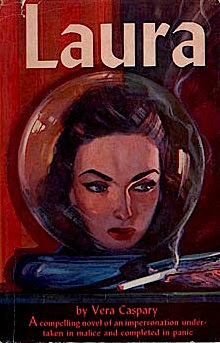 LAURA. Houghton, Mifflin, Boston, 1943. A 'psychothriller', the darkest of noirs. A curiously elusive and much sought after book, a sleeper... A big sleeper, although several high profile prices have alerted punters to its real price. Highly uncommon novel (as a first) on which the one of the greatest of Hollywood's 1940s films was based. This film noir mystery directed by Otto Preminger in 1944 was awarded two Oscars and starred Gene Tierney, Dana Andrews and a young Vincent Price. There is a scene in the bibliomystery 'The Sign of the Book' (John Dunning) where his detective /dealer sees a copy at a Burbank book fair change hands between dealers 6 times before the fair opens, moving from $600 to $7000 in a few minutes, possibly based on a real event. The psycho element in Caspary's novel comes from the way the book is written --from the five different viewpoints of the chief characters. VALUE? A review copy in a decent but not fine jacket made $12000 in 2005 at the Cosmatos sale (Sotheby's NY), a lesser copy lotted with 3 other nothing books made $2000 a few months later at Bloomsbury. Between the Covers appear to have sold their copy,at an undisclosed price, probably high as their prices are invariably breathtaking. There are currently no copies of the first on the web and they are distinctly thin on the ground. The Eyre and Spottiswoode UK 1944 first is worth about a tenth of US editions but is a decent substitute (pic below). 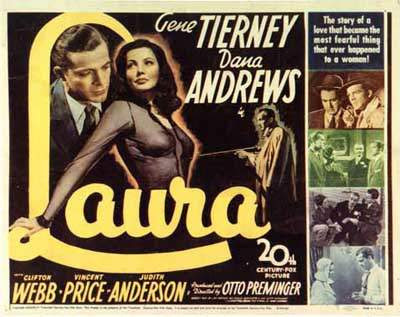 The theme for the movie Laura was written by David Raksin. Johnny Mercer added lyrics to make it a hit song. The movie was unavailable for several years on VHS or DVD. My local video rental place had a copy you could rent for $3.00, but you had to put down a $75 deposit because the copy couldn't be replaced. This got lost, I guess - I said a few minutes ago, a fabulous book and a fabulous movie. Gene Tierney was never lovelier and Clifton Webb never gave a better performance (one of his very rare dark ones.) Yes, a young Vincent Price as a gigolo and the great actress Judith Anderson in a supporting role. Doesn't get much better than this. And, what movie today can boast lines like, "I don't use a pen, I use a goose quill dipped in venom"?